Standing before Pilate, Jesus is mostly silent as he is condemned to death. Rather than incriminate Jesus, this silence indicts the system that charges him, magnifying the injustice at play. Ndume Olatushani’s art installation at the United Methodist Building reflects this theme and more in Station 1. Drawing from his own experience and that of countless others, artist and death row exoneree Olatushani explores the gross injustice present in the contemporary American criminal justice system. 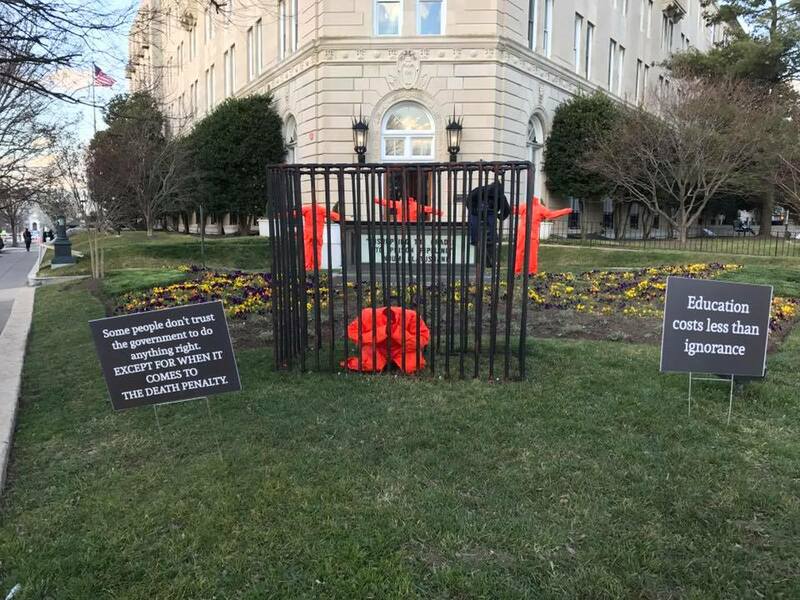 A four-by-nine-foot cage, orange jumpsuits, and signposts draw attention to injustice in varying forms, including wrongful conviction, disproportionate punishment, for-profit imprisonment, racial bias, and systemic mass incarceration. The setting of the United Methodist Building, a religious center for justice, sharpens the critique. Facing the Supreme Court, the art installation issues a challenge: as with Jesus in Pilate’s court, justice is revealed not as a matter of abstracted jurisprudence, but as a matter of moral urgency and, ultimately, human being. After flogging, beating, and humiliation, Jesus takes up the cross to walk to his death. It is a difficult scene: staggering under the weight of the instrument of his own death, he must embrace that which will kill him. 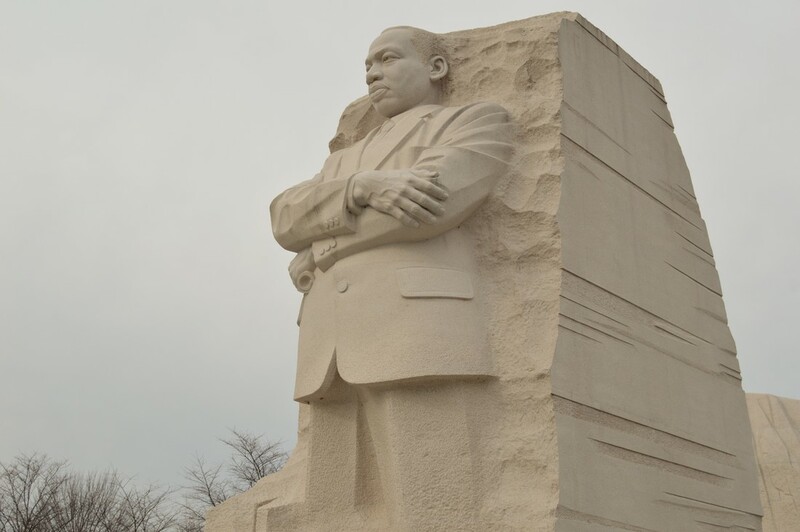 The Martin Luther King Jr. Memorial honors a man who embraced a national struggle that demanded a martyr’s end. 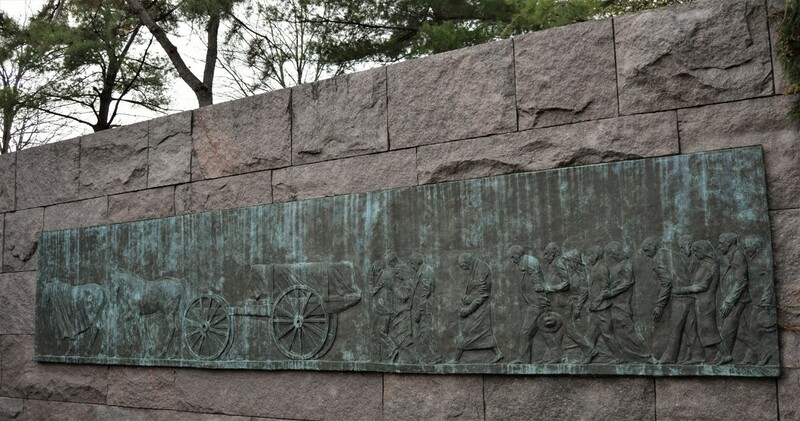 Entering the memorial through a narrow pass, visitors emerge in a clearing and encounter a larger-than-life granite sculpture of King. “Out of the mountain of despair, a stone of hope,” the sculpture reads, quoting King on the struggle. The arc of wall which surrounds the clearing with inspirational quotes lends a sense of forward movement to the space. Standing alongside King, we are simultaneously with him in his journey and alone in our present time, conscious of his journey behind and our journey still ahead. Rather than signaling a triumphant end, King’s struggle for justice as Station Two reminds us that the twentieth-century movement for civil and human rights was just the beginning. The Crucifixion was but the final torture inflicted upon Jesus. At every juncture on the way to Golgotha he endured further public humiliation. Yet each indignity, from his first stumble onwards, further revealed his glory. 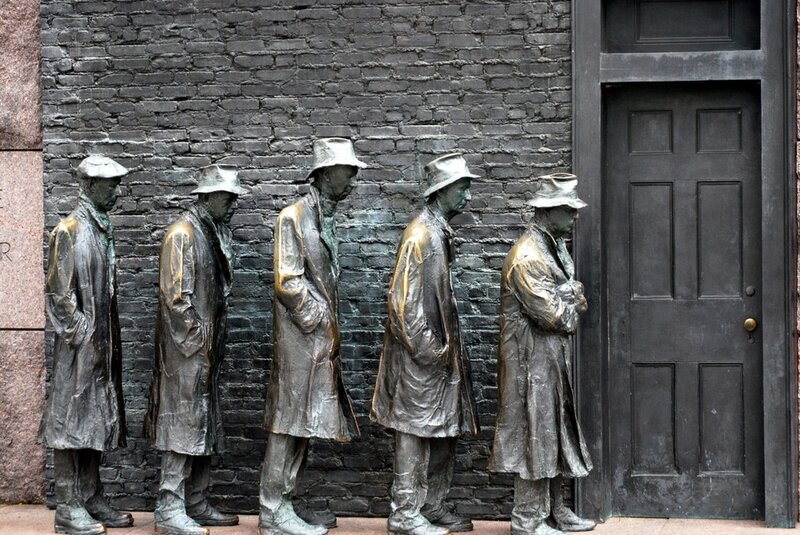 The scruffy figures in George Segal’s sculpture have fallen upon hard times, shuffling slowly forward as they await food for their families. Most monuments exalt their subjects, rendering them in superhuman scale, proudly enshrined on pedestals. Working from plaster molds of friends, Segal celebrates his subjects not for their pretensions to divinity but rather their undimmed humanity. Suffering only serves to burnish their dignity, not corrode it. “At the Cross her station keeping/ stood the mournful Mother weeping/ close to her Son to the last. Through her heart, His sorrow sharing/ all His bitter anguish bearing/ now at length the sword has passed.” These first two verses of the well-known hymn Stabat Mater, while depicting Mary keeping vigil with her son on the cross, speak to the greater pain that Mary surely experienced throughout her son’s torments on that fateful day. 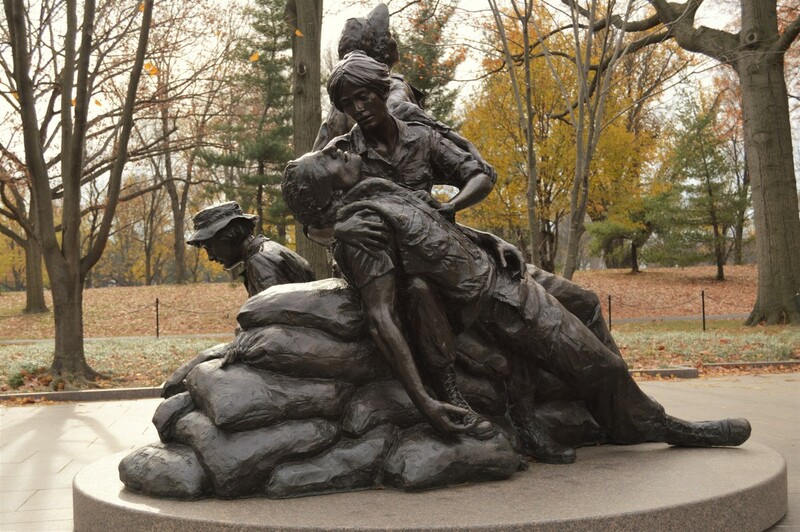 These verses also capture much of Glenna Goodacre’s bronze sculpture, which invites the observer to view the work in the round and consider the scene as a whole, three nurses and a wounded soldier, but also how it is that each figure responds to the situation. As Mary was with her son, these women, and countless other combat nurses, will be close to their patients to the last. These women share his sorrow, bear his anguish. This fourth station, along with the two that follow, shift our attention from Jesus’ sufferings to its impact on those around him. 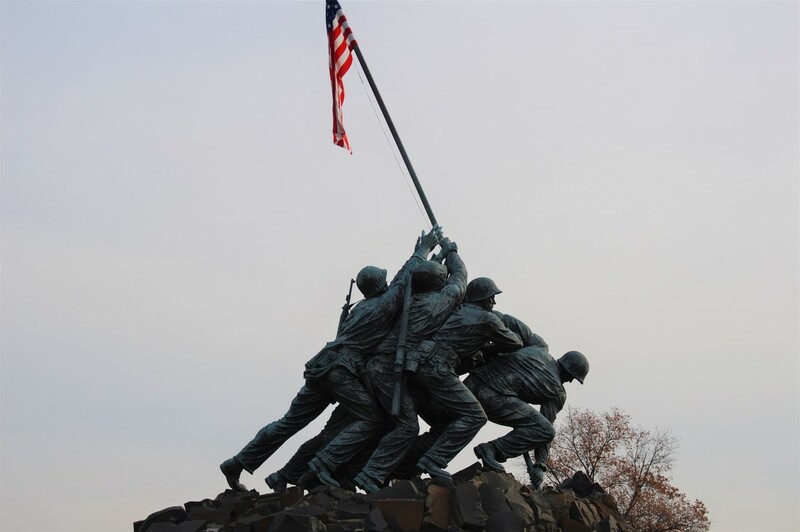 Felix W. de Weldon, the sculptor of the statue for the Marine Corps War Memorial, who himself served in the US Navy, took inspiration for his work from a photograph taken when the American flag was raised on Iwo Jima, a tiny island 660 miles south of Tokyo. Capturing the island represented a significant step in the American effort to bring the Pacific campaign to conclusion in 1945. The Fifth Station of the Cross recalls the story of Simon of Cyrene. As Jesus struggled towards Golgotha, Simon stepped out of the crowd. Taking hold of the cross, he shouldered Jesus’ burden, not just physically but spiritually. In the sculpture of the marines we see not only a memorial of war, but--just as importantly—a reminder that these marines (not all of whom survived) help one another to lift the flag. The flag is not the cross, but this memorial encourages us to consider the power of shared sacrifice. It is a reminder to share in one another’s struggles, to bear one another’s burdens. ​According to legend, Veronica is a woman of Jerusalem who offers Jesus a profound, if simple, kindness on his sorrowful journey through Jerusalem. She wipes the sweat from his brow. 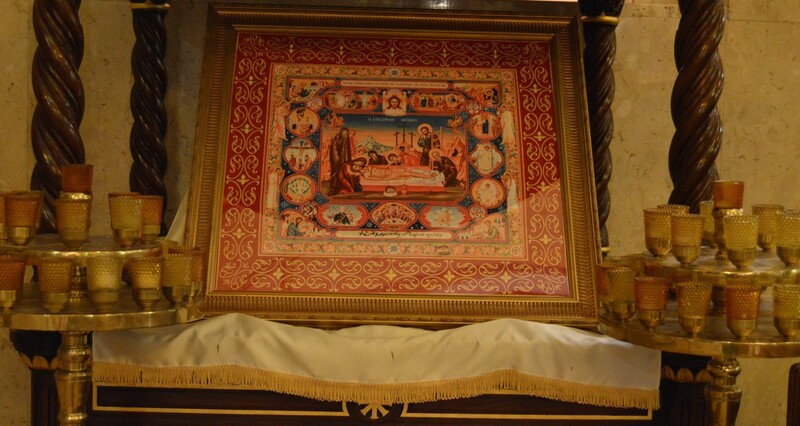 Miraculously, an imprint of Jesus’ face remains on the cloth. 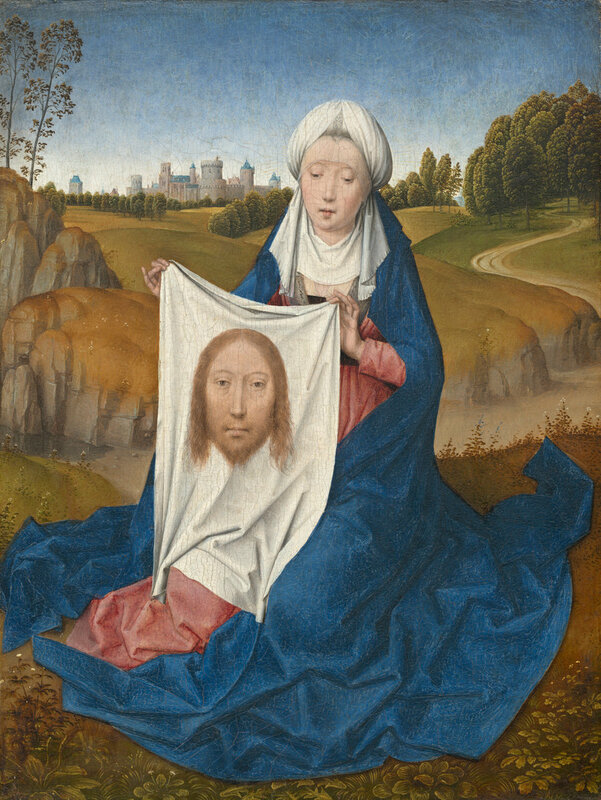 The subject of Memling’s Saint Veronica appears to recall the events of that day in her mind as she displays the cloth with the holy face. Remarkably Jesus’ face is unscathed, despite having been beaten, spit upon, and crowned with thorns. His face is serene, staring straight out at the viewer, forcing the viewer to confront the irony that Jesus’ humiliation was also his exaltation. The juxtaposition of the tranquility in this painting to the chaos of Jesus’ path to Calvary is jarring. 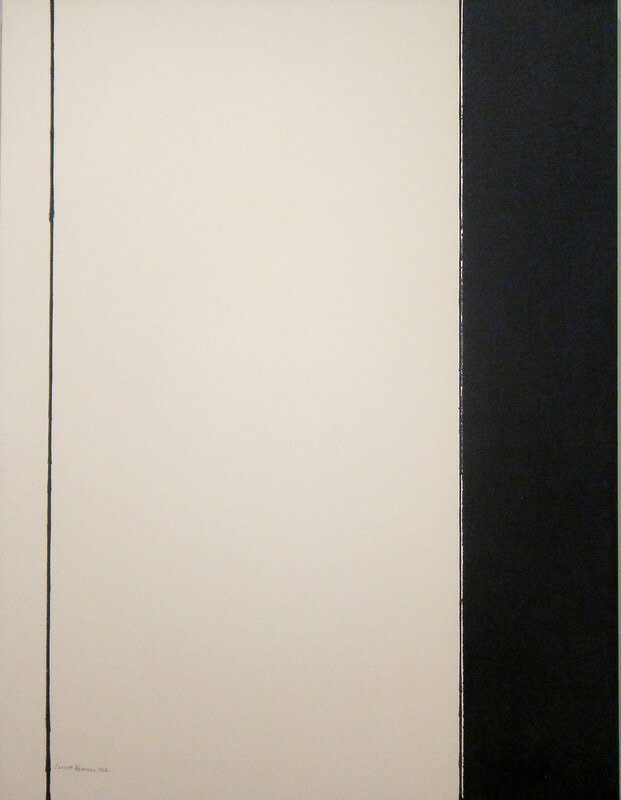 It is fitting that Barnett Newman’s magnum opus occupies the seventh station, at the heart of this journey. Newman did not see the Stations so much as a narrative sequence as fourteen permutations on a single moment. The pain of the Passion was embodied for Newman by Jesus’ haunting cry from the cross: “Eloi, Eloi, lema sabachthani?” “My God, my God, why have you forsaken me?” (Mark 15.34). As a Jew, these words acutely recalled for Newman the recent tragedy of the Holocaust. Yet the artist hoped his works would also speak to the anguish and abandonment of innocent victims everywhere. Today, these raw, unprimed canvases, stretched to human scale and scarred by somber streaks of black and white, continue to address us with urgent clarity. As both an Israeli and a mother, Leni Dothan responds to the theme of the eighth station from an unabashedly personal perspective. In the entryway hangs a large photograph of the artist and her young son. Where most images of the Madonna and Child present the pair facing the viewer, here we look over their shoulders as they themselves look towards an uncertain future, symbolized by a black void. The scarred wood that frames the image foreshadows the Crucifixion, and we are left to wonder whether they glimpse the trauma ahead. 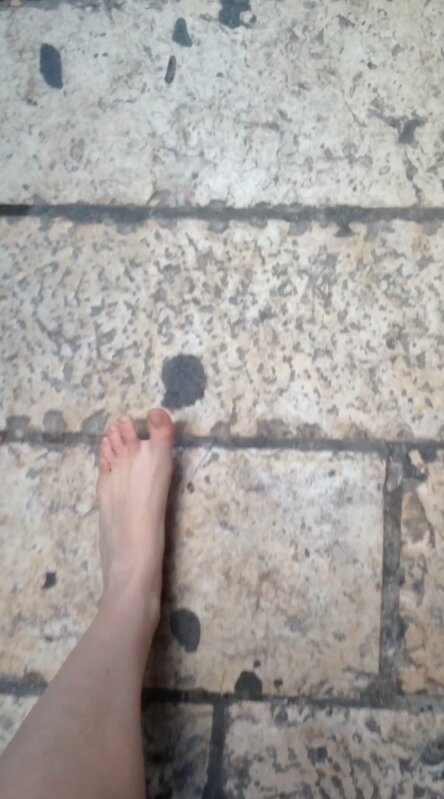 In the video, projected above the altar, we see only the artist’s bare feet, vulnerable against the ancient cobblestones as she walks the via dolorosa in Jerusalem. The video runs in a loop, making the Way of Suffering appear, on the one hand, interminable. And yet, the artist’s footsteps progress ever upwards, hinting at the possibility of resurrection. Perhaps this path of pain is also one of promise, for the women of Jerusalem and for all those who suffer. Michael Takeo Magruder offers a lamentation not only for the forsaken Christ, but for those who walk their own trails of tears in today’s Middle East. In particular, the artist remembers the hundreds of thousands of Syrians who have passed away in the present conflict, weaving their names and images into a contemporary Shroud of Turin. 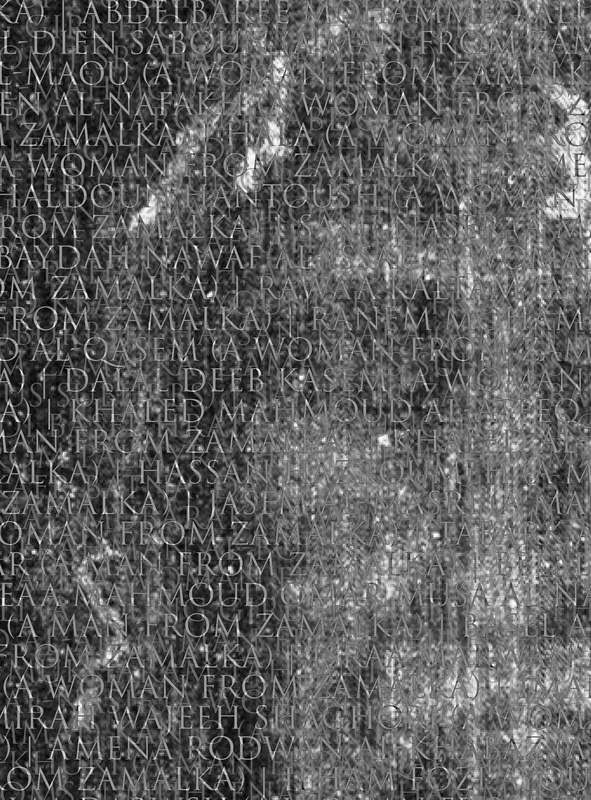 The Shroud, of course, is itself an image—an ‘icon’ in Pope Francis’ words—better known by its photographic negative than its actual fabric. Takeo’s digital re-presentation continues this history of reproduction. But the real miracle isn’t the Shroud itself, it’s our capacity to look with compassion into the eyes of the forsaken, to take responsibility for the Other. For more information on the current Syria emergency, please visit UNHCR. Installation viewable within Church of the Epiphany, Monday - Friday: 10:00am - 3:00pm. ​Consider making a donation to the Epiphany Welcome Table program. The stripping of the garments is the final humiliation Jesus faces before being nailed to the cross. Unlike what came before, this act of humiliation does not rely on Jesus’s agency, his participation in his own shame. Instead, the scene of soldiers taking and then dividing up Jesus’s clothes emphasizes the total powerlessness of Jesus. The stripping is an act that renders him subhuman or inhuman, devoid of will, voice, and ownership. It begins the objectification made complete on the cross—he becomes part of the scenery. 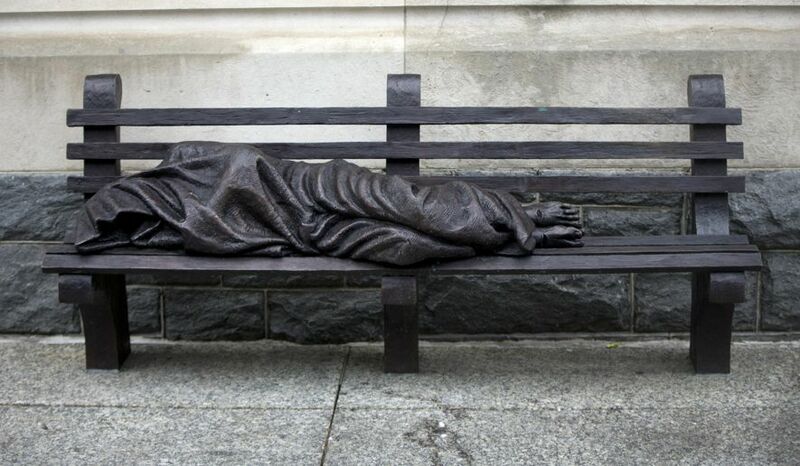 Timothy P. Schmalz’s sculpture Homeless Jesus reveals this horror to be a daily occurrence in modern society. A person, shrouded by a covering, is lying on a bench. Few passerby register the huddled figure; fewer still see the person, identified by holes in the feet. Translated through contemporary urban vistas, Schmalz reveals the human objectification that happens as a matter of societal norms: the vulnerability emanating from the sculpted figure does not endear the public to him (or her), but hardens us to their humanity. Homeless Jesus both reflects and enacts the poignant truth that Jesus is with the marginalized. Artwork visible on the street at all times. 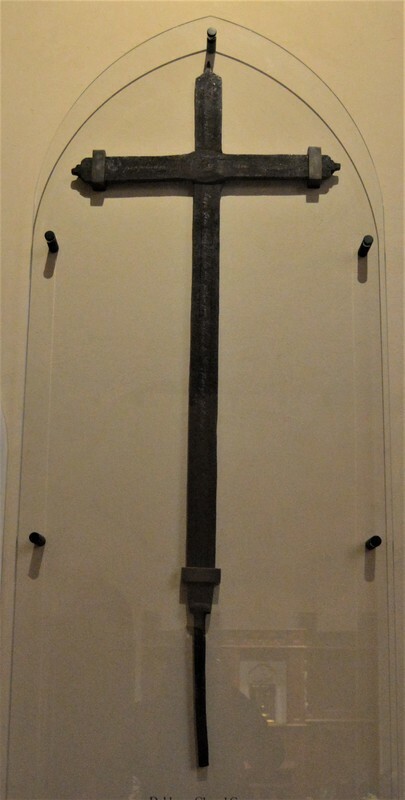 This ancient cross, which hangs on the wall in the south transept of the Dahlgren Chapel at Georgetown University is inscribed with ‘ad perpetual die memoriam’, which translates from the Latin as ‘may this be eternally remembered’. This seems a fitting inscription for a cross, which is believed to have been brought by Jesuit settlers sailing from England to America in 1634 on the Ark and the Dove. As such this beautiful cross is the oldest and the first manifestation of Catholic Christianity coming to the thirteen colonies. It reminds the visitor of the establishment of religious freedom in this country. The heavy, stark iron and the simple design of the cross call the visitor to pause and contemplate the harsh, bitter reality of the Crucifixion - the unwarranted torture and killing of an innocent man. The cross was recently included within the sanctuary of the Basilica of the National Shrine of the Immaculate Conception for the Papal Mass celebrated there in 2015. It seems a fitting choice for a pope whose ministry has focused on service and prayer for those whose lives have been scarred by persecution and poverty, including those—like the early settlers—in search of religious freedom. Fernando Botero is famous in his native Colombia and beyond for his cheerfully bulbous figures. 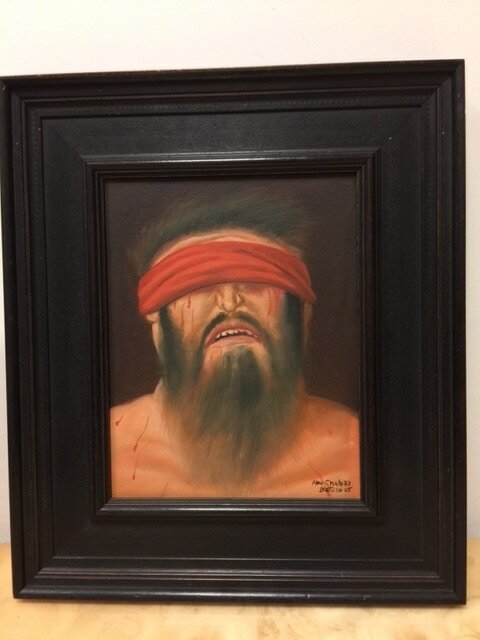 Here he takes his signature style and applies it to a gruesome subject: the torture of detainees in Abu Ghraib during the Iraq War. Seeing horrific photos emerge in the press, he felt compelled to paint the victims in a way which lent them dignity, rather than perpetuating their humiliation. “I was just trying to visualize what was really happening there,” Botero says. An artist “can make visible what’s invisible, what cannot be photographed.” To disclose this dimension, Botero turned for inspiration to canonical images of the flagellated Christ, the Man of Sorrows. While torturers toyed with their captives in a demented God-complex, Botero suggests that true divinity belonged to their innocent victims. Museum regular hours may vary, please visit their website for specific hours​, ​While the gallery may be closed the week of March 27 for the installation of a new piece, the Botero is still visible. Joseph of Arimethea, Noble Joseph, a wealthy and prominent member of the Jewish community in Jerusalem, took upon himself the charge of caring for Jesus in his death. Joseph’s great act of compassion, depicted here on the epitaphios, is memorialized in the hymnody for Holy Saturday: The Noble Joseph, when he had taken down thy most pure body from the tree, wrapped it in fine linen and, anointing it with spices, placed it in a new tomb. This verse is sung during the dramatic high-point of the liturgy in which the cloth is processed around the church in commemoration of Christ’s burial procession. This is a ritual outgrowth of the Presentation of the Gifts (the bread and wine), which are covered with a simpler cloth, an aer, for the Eucharist on Sunday. This processing of the bread and wine came to be interpreted by theologians as representing the burial procession of Christ, attracting the Noble Joseph imagery to the Sunday Liturgy, and eventually leading to a separate popular procession in Holy Week. The scene on the epitaphios juxtaposes the sorrow of death with the generosity of Joseph’s deeds - a kindness not only to the body of Jesus, but especially to his grieving mother Mary, who has one less thing to worry over. ​St Sophia’s Cathedral is open every Sunday from 8am-1.30pm. If you would like to visit at any other time, please don’t hesitate to call the Church 202 333 4730, explain you are here to look at Station 13 of the exhibition and someone will come and let you in to the church. Directly beneath the crossing in the Cathedral is the chapel dedicated to St. Joseph of Arimathea, who gave his sepulchre as a tomb for the crucified Christ. Descending into the Chapel feels like entering a mausoleum. The floor is slightly lower than the rest of the crypt, symbolizing the lowest point of Jesus’ story: the entombment. The mural above the altar by Jan Henrik DeRosen depicts the events leading up to Jesus’ burial. The three crosses of Calvary stand in the upper left. Below, St. John supports the Blessed Mother. Her grief is symbolized by a sword piercing her heart. At her feet, Mary Magadalene kneels in sorrow. Christ’s recumbent figure lies at the center. Nicodemus leads the procession into the tomb, followed by St. Joseph of Armimathea, holding the chalice that represents the Eucharist. 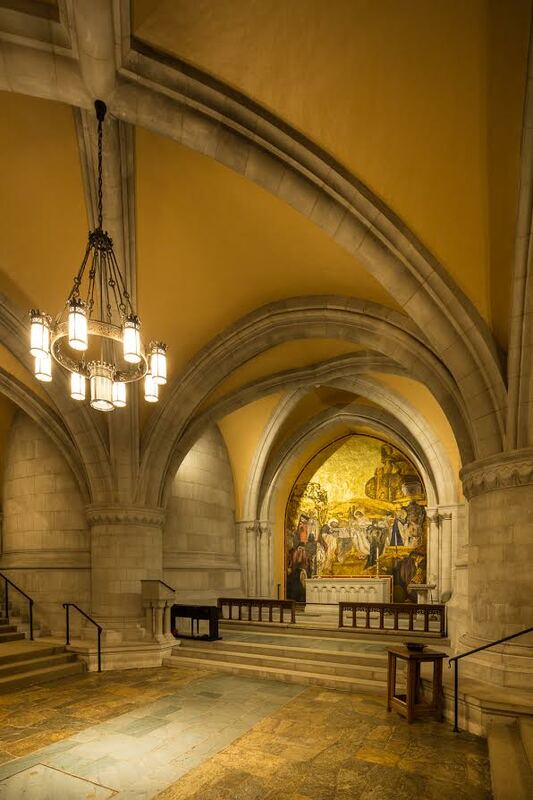 It is fitting that the chapel should also be the entrance to the columbarium, where the ashes of Helen Keller, her teacher, and others are buried. As you come to this final station we invite you to reflect upon how this pilgrimage has touched you. What has been put to death and where might you seek new life? Check the Washington National Cathedral website for visiting hours. The Cathedral admission fee will be waived for those visiting Station 14 at the Cathedral. Please approach the visitors desk and let the staff know that you are here for Stations of the Cross.